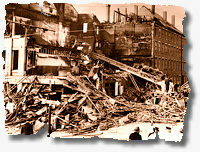 On November 15, 1942, six firefighters were killed, 43 injured, and many were trapped under debris for up to 18 hours. The story of the East Boston fire has been forgotten, if not lost, by many, pushed off the front pages by the terrible loss of life at the Cocoanut Grove only two weeks later on November 28, 1942. We all know of the Cocoanut Grove fire. The crowded nightclub, the locked exits, the 492 victims, the trial, the changes in the fire prevention codes that regulate decorations and places of occupancies, and so forth. But what about the fire two weeks earlier that killed six of our members and injured so many more, some so severely that many never worked on the job again. Across the street from the Maverick Square MBTA station are the remnants of a great old building. For years the building was known as the Old Amory Building. The building was a second class wooden frame structure of exterior masonry walls with exterior bearing walls, three and a half stories high, about 120 by 40 feet in area. Many political rallies were held there.. The fire started in the rear of Luongo's Restaurant, located in the first floor of the hundred years old Maverick Lyceum. A night worker discovered the fire. He told the firefighters that an electric appliance caught fire. He ran into the street and enlisted the aid of two citizens. They tried in vain to fight the fire. Fire headquarters received a call reporting the fire at 2:26 a.m. At 2:27 a.m. the East Boston companies were notified and responded from their fire station a few blocks away. The second alarm was sounded at 3:04 a.m., when the fire seemed to be making headway. The third alarm was sounded at 3:24 a.m.
Then at 4:15 a.m., without warning,the wall on the Henry Street side of the building bulged and collapsed, trapping firefighters in the building and burying Ladder 8. Fourth and fifth alarms were sounded to help in the rescue effort and to fight the fire which had gotten a fresh start after the collapse. Within half an hour ambulance, doctors, additional firefighters and rescue workers(including the Coast Guard) were rushing to the scene. The scene was one of pandemonium. Firefighters who were lucky enough to be clear of the wreckage, although injured, made desperate efforts to save their comrades. In the hours that followed, acts of heroism and bravery unequaled in the history of the department were witnessed. That more were not killed was due mostly to the gallant actions of firefighters. Their own lives at stake, many crawled into holes in the debris to pull their injured brothers free. As the rescue work was proceeding, the flames were cracking high in the air. The adjoining building on Henry Street caught fire and some fifty persons fled in their night clothes. When daylight came, exhausted and injured firemen were lying on the street, waiting to be removed to hospitals. The quick arrival of doctors and ambulances saved many lives. Without immediate hospital treatment more than one injured fireman would have died. The firefighters who died were on the second floor working with hose lines. The saddest part of the tragedy was that the fire was "under control" when the walls collapsed. The Department's 125 foot "jinx" aerial ladder, reported to be the biggest in the nation at that time, was standing beside the falling wall on Henry Street. It was buried in the wreckage. The ladder was originally purchased by the City of Somerville. They found upon delivery that it was too big for their firehouse. Boston bought it. The truck had a series of problems. There was some speculation that due to the long ladder and wide bed, the large ladder might have caused the wall collapse. This theory was later ruled out. In fact, some of the firefighters who were on the ladder at the time of the collapse, credit the ladder bed with saving their lives. When the granite and debris began falling, they lay down in the bed and the rubble slid down over them to the street. Many felt that this was the end to the ladder. But, it was repaired and returned to service in South Boston as Ladder 19. Tragedy would continue to haunt this piece of apparatus. On December 3, 1947, Ladder 19 was out of service conducting tests on its brakes when it overturned and rolled. Provisional Firefighter Joseph B. Sullivan, on the job for less than six months, was killed. The Department took the truck out of service and scrapped it.